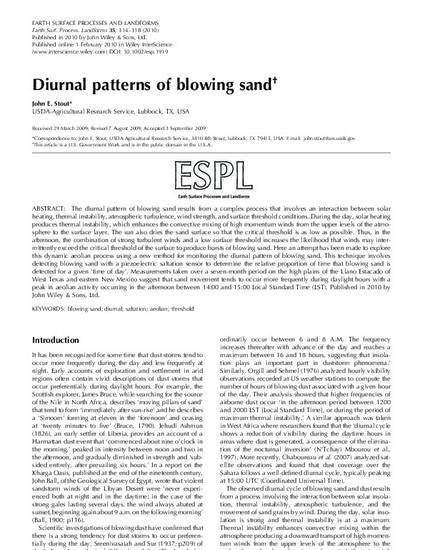 The diurnal pattern of blowing sand results from a complex process that involves an interaction between solar heating, thermal instability, atmospheric turbulence, wind strength, and surface threshold conditions. During the day, solar heating produces thermal instability, which enhances the convective mixing of high momentum winds from the upper levels of the atmosphere to the surface layer.  The sun also dries the sand surface so that the critical threshold is as low as possible. Thus, in the afternoon, the combination of strong turbulent winds and a low surface threshold increases the likelihood that winds may intermittently exceed the critical threshold of the surface to produce bursts of blowing sand. Here an attempt has been made to explore this dynamic aeolian process using a new method for monitoring the diurnal pattern of blowing sand. This technique involves detecting blowing sand with a piezoelectric saltation sensor to determine the relative proportion of time that blowing sand is detected for a given ‘time of day’. Measurements taken over a seven-month period on the high plains of the Llano Estacado of West Texas and eastern New Mexico suggest that sand movement tends to occur more frequently during daylight hours with a peak in aeolian activity occurring in the afternoon between 14:00 and 15:00 Local Standard Time (LST).